Glancing at the mountains, we were quite anxious about our day ahead. Not because there was going to be any surprise or that we were going to meet His Majesty (which we were still hoping for). We were anxious simply because our kind tour guide, Mr. Jigme had told us the night before that we'll need to climb more than an hour to reach our first destination today. And according to him, this was considered "easy". 1.5 hours of uphill trekking may sound like child's play to many. But to us, it was a tall order. The last time I ran 2.4 km was 24 years ago. I was an artist during National Service and didn't have to run a kilometre. I had no reservist, no IPPT. I have been driving for years and had rarely needed to walk more than 10 mins to anywhere in this well-connected lion city. To make things worse, we don't exercise. I decided to take a short morning walk around Hotel Osel to warm up but it was too cold. So I ended up having a chat with these two friendly guides who were waiting for their guests at the hotel driveway. After a hearty breakfast to ensure that our energy levels were at their fullest, we hopped onto our vehicle for an hour's drive to Tango Monastery. Along the way, we made a brief stop at a hairpin turn where we got our first photo-op with Guru Rinpoche. A majestic, colourful cliff mural of Guru Rinpoche (Padmasambhava), an 8th-century Indian Buddhist master who was reincarnated in a lotus blossom, also more widely called the 'second Buddha'. And of course, he was the one who flew on the back of a flying tigress that gave Tiger's Nest its famous name today. Yes, please keep everywhere, everything, and everyone clean. Two prayer wheels spinning with their integrated water mills and stream below the hut (the small building as seen in front of the cliff mural). After another 15 mins of bumpy car ride, we reached the foot of Tango Monastery to get ready for our first hill climb in Bhutan. To our pleasant surprise, our driver Mr. Sangye pulled out 4 wooden walking sticks from the boot. They came in really handy in balancing our footsteps along the uneven tracks and sometimes steep gradient. The humble entrance and starting point to get to the Tango Monastery. 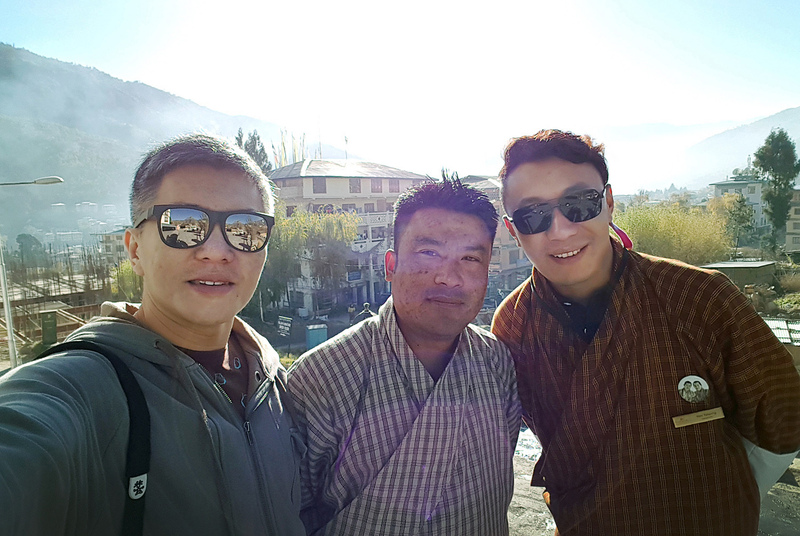 Our adorable and techie tour guide, Mr. Jigme, always providing us with interesting and useful information along the way. 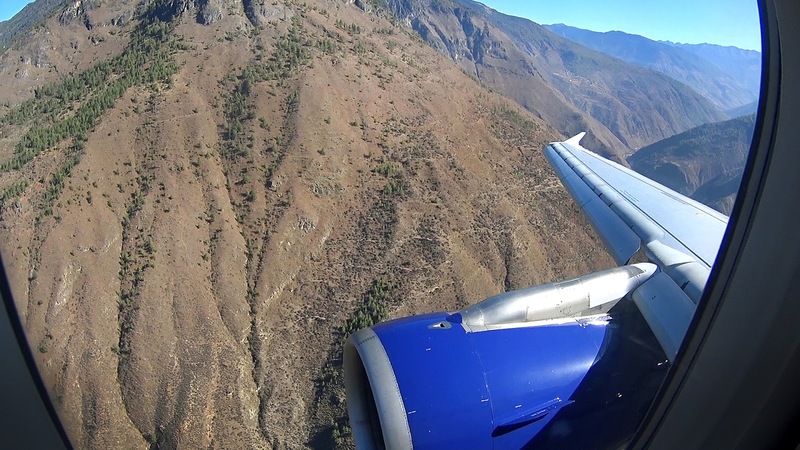 Typically, altitude sickness starts at 8,000 ft (2,438m) without acclimatisation. Lots of friendly dogs in Bhutan. They were certainly as friendly as the people. Somewhere mid-point. An elegant stupa and a rest stop. And finally, after 1.5 hrs of uphill task, we arrived at the famed Tango Monastery. The total ascend from the car park to the Monastery is approximately 280m in altitude difference. So theoretically, it took us 19 secs to conquer every 1m vertically. That may sound sloth-like but to be fair, we made several rest and photo stops as usual. And not forgetting the elevation to start with. The Tango Monastery was extremely peaceful and indeed, like what a monastery should be, celestial and clandestine. Incidentally, there were ongoing repair works and those timber scaffolds and skip bin didn't do justice to the beautiful entrance. Suddenly, the entire place burst into life upon entering the main courtyard. Cladded in burgundy robes, groups of monks gathered in the sun and gobbled their simple meals, some standing, some squatting, all sharing the limited common space for a time of good chat and fellowship. Gorgeous architectural details and intricate wood carvings adorn every façade of the 17th century building. We were fortunate to come face to face with a troop of langurs, the Tarai gray langur to be specific. Native to Bhutan and India, they are classified as "near threatened". What a beautiful animal! From reds to burgundy and maroon. Life is simpler when there isn't many choices. Walked past several houses perched precariously on the rocky cliff on our descend. We really wonder why did Bhutanese in the past loved building on vertical surfaces so much. While getting to one of these houses may not be easy, building them was definitely more difficult. But I guess all the trouble will be worth it with the million dollar views they offer of the surrounding valleys. Prayer flags fluttering gently in the forest breeze. These ubiquitous prayer flags of blue, white, red, green and yellow represent the five elements of sky, wind, fire, water and earth respectively. Hence, prayers are printed on the cloth and hung high for the wind to spread these prayers in all directions, spreading goodwill, peace, compassion and benefit to all beings across the world. It's a misconception that these prayer flags bring prayers to the gods. A local resident in the Cheri mountains. If you have read the tips and info section at the end of each day's blog, you would know that alcohol is NOT available on every Tuesday. They call it the "Dry Day". I guess I'll call it "Thirsty Day". A group photo of our guide, Mr. Jigme and the beautiful staff at our lunch restaurant in Thimphu. After lunch, we visited the Bhutan Post Office for a short tour and some souvenir shopping. The Bhutan Folk Heritage Museum is a small but well-stocked museum, showcasing the fascinating traditional Bhutanese way of life. A worthy stop to slow down and enjoy the tranquility that surrounds the museum - a 3-storey 19th century Bhutanese house. Our last stop for the day was none other than the monumental Thimphu Tashichho Dzong. Other than the colossal dzong architecture, it is also well known for its equally enormous national flag which cannot be missed. Extremely friendly stray dogs keeping us company before the doors of Tashichho Dzong were opened to the public for visit at 4.30pm, which is when the government offices in the Dzong have closed. The Tashichho Dzong is a massive complex and fortress. Behind the elegant and well-proportioned whitewashed façade of distinctive Bhutanese architecture lies a Buddhist monastery, government offices and most importantly, the throne room and office of the King. The only public entrance into the Dzong. Everyone was required to have their bags checked through metal detectors. Monks can be seen in the Dzong as there is a Buddhist monastery within. A panoramic view of the central plaza in Tashichho Dzong. Fortunately, it wasn't crowded at all, possibly due to the off-peak season. At around 5pm, the flag bearers will lower the giant national flag and safe keep through a brief ceremony. Remember to catch them in action! Astonishing details on the façade and windows. The peace and tranquility was amazing as we exited the Dzong after the crowd. Do not rush, let other visitors leave first and take your time to enjoy the place while strolling down the rose garden. The National Assembly of Bhutan building could be seen opposite the Tashichho Dzong across River Wong Chhu. It's the parliament building of Bhutan. The same sunshine that had greeted us good morning was retreating with the same brilliance in the Himalayan skies as we made our way back to our vehicle. From soaring the monastery of Tango to strolling the grounds of Tashichho, it was no doubt a tiring day for us but definitely a happy and rewarding one! Thanks to our cheerful guide, Mr. Jigme.